If any of our readers had ever been in any doubt as to why we occasionally try to “shoot the moon” with a risky options idea containing weekly expiration contracts on a Friday, then this past Friday’s session answered their questions for good. We try to shoot the moon, because occasionally you can actually hit it! That was certainly the case with the SPY Weekly $238-50-239.50 Calls that we highlighted in Friday morning’s premarket report. As you can see, those gain opportunities ranged from really good, to ridiculously good, to full on eye-popping! Cheers to anyone who was along for the ride! 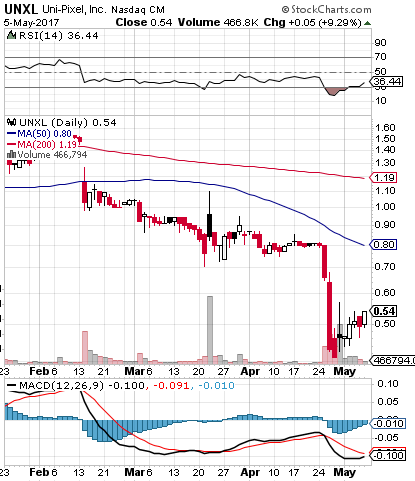 We’ve taken notice of what could be a prime rebound opportunity in UNXL. As you can see plainly on the chart below, the stock bottomed out at the end of last month, and has thus far been building a higher base of support in the month of May. We’re eager to track this play to see if the trend will continue because if you’ll notice two of our favorite technical indicators on this chart, the RSI and the MACD, both are exhibiting an extremely bullish look at the moment. We’re going to place UNXL on intensive watch, because the party could just be getting started. Extra Note: For an added bottom-bounce possibility, we’ll also have California Resources Corp. CRC on our radar, as it just underwent a bullish reversal on Friday, and maintained more than half of its daily gains.